When people go to Seattle, they usually leave with three things: fish, chocolate, and coffee. Bean Box — a new coffee supplier — is trying to make it more convenient for you to grab the third option without ever having to travel to Seattle. 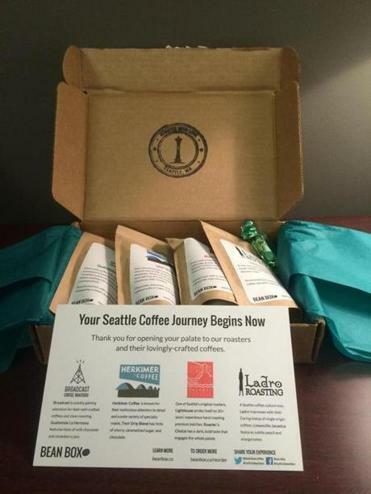 The company is specializing in a growing area in the coffee industry: specialized coffee, sent in the mail. But Bean Box is unique in that it is grounded in one place, with all the coffee coming from the hub of the coffee universe. It’s like having a friend go to Seattle and retrieve a bunch of coffee for you. Or having someone send a much-needed coffee care package your way. Bean Box started about two months ago, growing out of a fairly simple idea: Seattle has great access to great coffee. There are 22 roasters inside the Seattle city limits, doing 200 different roasts at any one time. It costs $20 a month to subscribe, and you get a shipment of coffee from four roasters. Each bag has about 50 grams of coffee, enough for me to make about three cups. Said another way, you’re paying $20 for less than half a pound of coffee. Expensive, for sure, but you’re paying for the quality and freshness. And Bean Box is an evangelist for freshness. While wine has about 700 different compounds, Berk says, coffee has somewhere near 4,000. In the first 30 days, Bean Box was shipping to 34 states. They’ve been hand-writing the roast date on each bag, and they’ve run into a good problem: They’re getting hand cramps. They pick up the fresh-roasted coffee from roasters, get it ready and shipped within a day. They use USPS, which takes one to three days to ship in the United States. My box of beans arrived at my door six days after it had been roasted, with coffee from four roasters: Broadcast Coffee Roasters, Herkimer Coffee, Ladro Roasting, and Lighthouse Roasters. On the bag were some of the standard descriptions, but with some clever additions from Bean Box (Lighthouse was “a bold roast with a real kick, refined like a gentleman”). The package also included a chocolate nugget from Seattle Chocolates (so you’re getting the coffee and chocolate that people go to Seattle for; thankfully, there was no fish in this box). I opened the Roasters Choice from Lighthouse Roasters first. It was bulging with air and seemed most in need of release. Each coffee was unique, and interesting in its own way. In making pourover coffee, there’s a phase called the “bloom,” where you pour a smaller amount of water over the beans to let the gases begin to release. You know it’s fresh when there’s a large bloom. With the coffee from Bean Box, the bloom was extraordinary. And that, to me, seems like the advantage of a place like Bean Box. There are other coffee-by-mail services (we’ll review some of those later). Some are cheaper, or provide more coffee in the shipment. Others are sent from one roaster, giving you the ability to order beans just from your favorite spot. With Bean Box, the selection was great. I love sampling coffee from different places, and it was an added benefit that all of them came from one city. And even though the subscription is a little pricey, the freshness is hard to beat.